The response during the ISS Long Beach show held in January, 2014 for the Fruit of the Loom, OKI Data and Graphics One give away was a resounding success. Hundreds of attendees visited the Fruit of the Loom and Graphics One booths to see and hear about Fruit of the Loom's sports apparel and to also see and hear about the GO UNO T-shirt system. 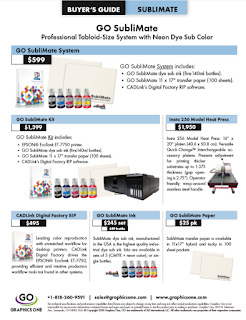 Indira Mehta of Crazy Design in Chatsworth, California was the winner of the GO T-shirt system which included t-shirts from Fruit of the Loom, GO UNO LED transfer printer for garments, Metalnox Heat Press, GO UNO paper and a variety of add-on products. Additionally, all of the LED transfer printers offered by GO are developed and manufactured by OKI Data, including the GO UNO. As Indira said, "I am delighted to have won such a professional system. It will go to great use in our Crazy Design studio."